Wednesday, May 16, 2018, 7:00 p.m.
Once again, Heritage’s Babes with Books (BWB) Women’s book club has accomplished the “near impossible” by arriving at consensus (at least momentarily) regarding the reads and activities for the next eight months of meetings. Shown below are the selections, with some “keep tuned” caveats as things may change as the dates approach. 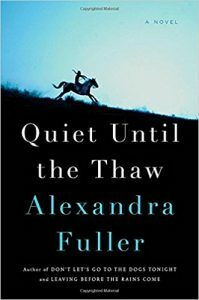 May 16: Quiet Until the Thaw, by Alexandra Fuller. June 20: Young Jane Young, by Gabriel Zevin. July 18: Allie and Bea, by Catherine Ryan Hyde (possible pool party – keep tuned). August 15: The Totally Unscientific Study of the Search for Human Happiness, by Paula Poundstone (possible pool party – keep tuned). September 19: The Sleepwalker’s Guide to Dancing, by Mira Jacob. October 17: Perfection, by Kathleen Wade (yes, Heritage’s own Kathy Wade). November 21: Carrying Albert Home, by Homer Hickam (possible date change – keep tuned). December 19: Movie (TBD) & Party. The May 16 selection is set in Lakota Oglala Sioux Nation, South Dakota where two Native American cousins are pitted against each other as their tribe is torn apart by infighting. All meetings are from 7 to 9 p.m. in the Heritage Room, unless otherwise noted. All Heritage women and female friends are always invited. If you have questions, contact Barb Barnes at BWB@huuc.net.